Massive Study Looks At How Heights Around The World Have Changed Over The Past Century : Goats and Soda A massive study looks at how heights around the world have changed over the past century. 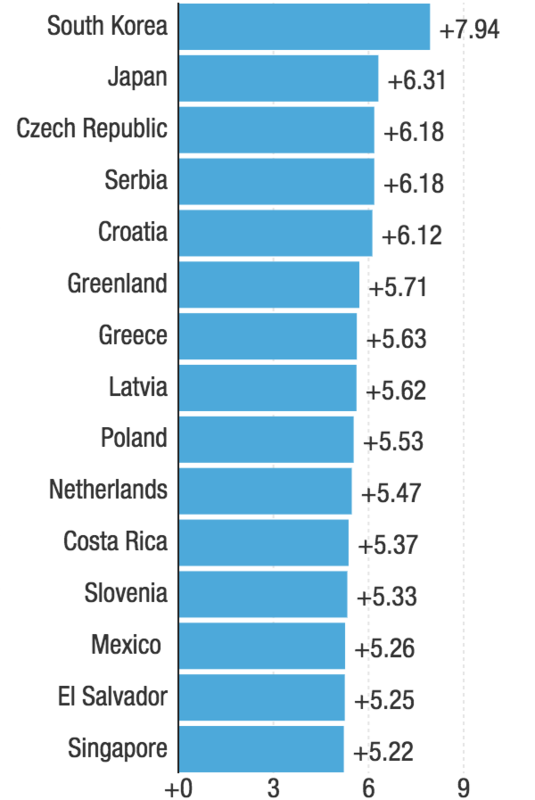 The countries with the tallest and shortest 18-year-old men and women in the world, according to a new study. The country is having a massive growth spurt. And it doesn't look like it's slowing down anytime soon. In contrast, Americans are falling behind. Back in 1914, the U.S. had the third tallest men and fourth tallest women in the world. Now it's in the middle of the pack, ranking around 40th for both men and women. American stagnation: In the past century, Americans haven't actually grown very much — only about 2 inches. 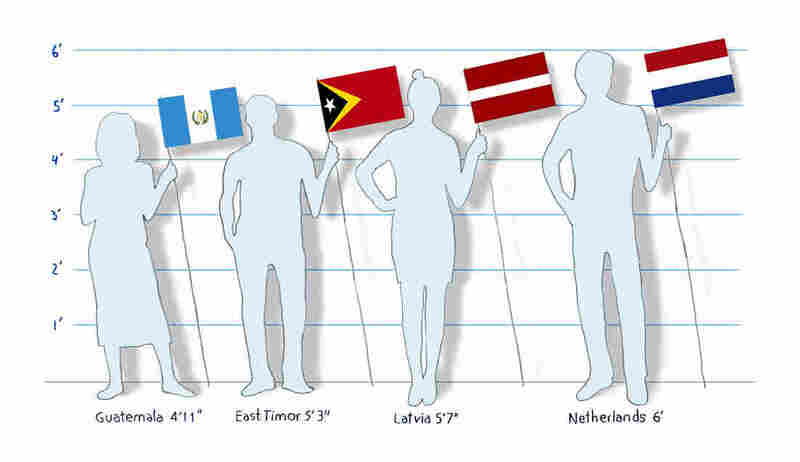 The gender gap: Men are taller than women in every country by about 5 inches, on average. A century ago, that difference was slightly lower, at 4 inches. Here in the U.S., heights have plateaued — or even started to decline slightly. They peaked in 1988 for women and 1996 for men. Income inequality has increased in the U.S. since the 1970s, the Center on Budget and Policy Priorities reported. "In some sense, you have a large part of the population who are not getting quality food," Ezzati says. "That drags down the whole place." "You have countries that suddenly cut their entire health care budgets and agricultural [budgets] by large amounts," Ezzati says. "Those who were affected the most were the poorest." Nutrition and the number of childhood infections help determine how tall you grow. "And there's increasingly good evidence that people who are taller on average tend to live longer," Ezzati says. "A big part of that is due to a lower risk of cardiovascular disease [for taller men and women]," he says. Taller women also have a lower risk of complications during childbirth, and their newborn babies are less likely to die than those born to shorter women. In contrast, shorter people have a lower risk for some cancers, such as colon cancer, Ezzati says. "But on the balance, it's better to be taller, healthwise." And having extra inches as a kid is also connected to success later in life. "Being taller is actually a good marker of better educational attainment and higher income," he adds. "Those are big changes with big benefits [to society]."